Bustling towns, scenic harbors, picturesque bayscapes, delightful villages and spectacular mountains-to-the-sea views make Downeast hugely popular among cyclists. The region is home to the breathtaking Acadia National Park as well as numerous easily reached islands. The 10-mile loop begins in Winter Harbor. Grindstone Neck has scenic views and a picnic spot. The 12- and 24-mile loops take cyclists through the easternmost reaches of Acadia National Park to beautiful Schoodic Point, as well as through picturesque fishing villages and along a dramatic stretch of Maine’s rocky coast. There is so much to see on these 25- and 39-mile loops through Downeast Maine that you may want to take the whole weekend to ride them. The fishing villages, beaches, and coves along the way beg additional exploration. The centerpiece of the 39-mile ride is the working fishing village of Stonington that in earlier times was home to several granite quarries. Washington County is one of the last places in the busy, overcrowded Eastern seaboard where you can get away by yourself on a forest trail or bicycle ride, or walk for miles on the salt-sprayed shoreline and see no one. This 125-mile seaside ride takes cyclists from Midcoast to Downeast Maine. The coastal route offers gorgeous views of Maine’s rocky coast and historical sites while providing a glimpse of coastal living. See Maine’s rural and agricultural past and present. This 140-mile ride takes cyclists through the heart of Downeast Maine. The route offers an unforgettable combination of the best of rural Maine and its small towns and villages, blueberry barrens and bald eagles. The 85 mile Down East Sunrise Trail runs along the entire Downeast coastal area, connecting multiple scenic conservation areas, intersecting salmon rivers, and is very near two state-designated Scenic Byways. Adventure Cycling’s Northern Tier route begins in Anacortes, Washington and traverses 13 states before ending in Bar Harbor, Maine. 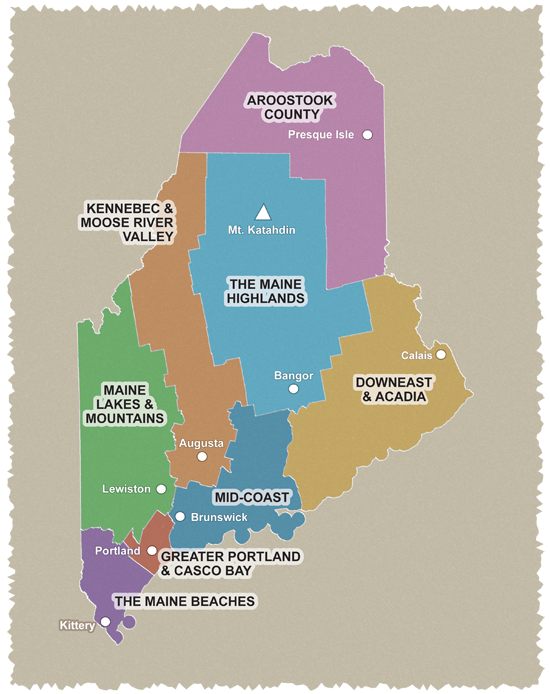 The Maine section of the route takes cyclists on a 224 mile ride from Fryeburg through lakes, mountains, forests, and farms across rural southwest Maine and then follows the coast to historic Bar Harbor.